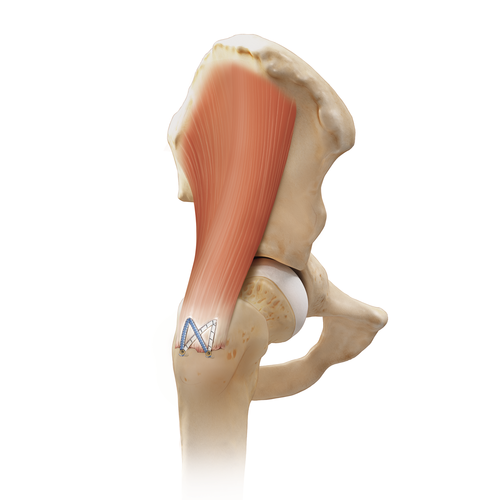 The ligamentum teres is a ligament responsible for stabilizing the ball and socket joint. It runs from the center of the acetabulum (socket) to the center of the femoral head (ball). The ligamentum teres also contains an artery that supplies blood to the femoral head. Ligamentum teres ruptures are caused by falls, twisting or hyperextension injuries to the leg. Collisions in sport are also common causes of ligamentum teres ruptures. The overall incidence of ligamentum teres ruptures is small. Ligamentum teres ruptures may cause pain, a locking or catching sensation and popping with movement of the hip. Bleeding in the joint may also occur, making the joint feel tight or swollen. This may lead to calcification of the ligament. Your surgeon will perform a thorough history and physical exam with X-rays. The hip will be moved through a range of motion and stressed in certain ways to elicit pain or feelings of laxity. X-rays do not aid in the diagnosis. MRI is helpful in confirming the diagnosis. Some ligamentum teres ruptures are found at the time of arthroscopic surgery when the surgeon is treating other injuries. Ligamentum teres ruptures are usually an incidental finding and associated with other injuries in the hip. Your surgeon may prescribe anti-inflammatory medication, physical therapy and activity modification to decrease pain and inflammation. If the symptoms resolve, no further treatment is necessary. Since ligamentum teres tears are usually associated with other pathology, they may not be diagnosed until the time of surgery when the surgeon is treating other pathology. If recognized, the surgeon may choose to resect the ruptured tissue, as other ligaments of the hip help with stability and other vessels help with blood supply. Your surgeon may also choose to repair or reconstruct the ligamentum teres with a graft (from a donor) and a series of sutures, screws or buttons to repair the graft to the bones. The gluteus medius and gluteus minimus, the hip abductors, are muscles that attach to the outer aspect of the hip (the greater trochanter) by a thickened portion of non-elastic tissue called tendons. The abductors are responsible for abducting the leg, or moving it away from the body. Tears in the abductor tendons can either be partial or complete. Abductor tears are typically repetitive, overuse and degenerative in nature. Tears in the abductor tendons may also be secondary to multiple corticosteroid injections given in the area for trochanteric bursitis. Abductor tears can mimic trochanteric bursitis, causing pain in the outer aspect of the hip over the greater trochanter. Abductor tears, unlike trochanteric bursitis, cause a decrease in motion and loss of strength in the gluteus medius and/or gluteus minimus. Patients with abductor tears may also find it difficult to balance or keep the hips straight while standing on one leg. Your surgeon will perform a thorough history and physical exam including X-rays. Exam findings will consist of loss of active range of motion (patient moves the hip), preserved passive range of motion (the surgeon moves your hip), weakness and pain with muscle testing. X-rays may or may not demonstrate calcification near the tendon insertion on the greater trochanter. MRI is helpful in diagnosing the tear. Non-operative treatment for partial and small tears of the abductors may be beneficial. Your surgeon may prescribe anti-inflammatory medication, physical therapy, cryotherapy and activity modification. Your surgeon may offer an injection. Patients whose pain does not resolve with non-operative treatment should discuss surgical treatment options with their surgeon. 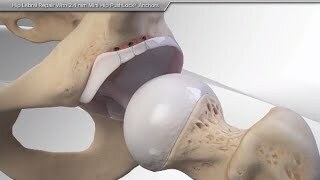 Abductor tears that fail to improve with non-operative treatment can be treated with a minimally-invasive arthroscopic or open procedure. The tendon(s) are repaired back to the bone with sutures and anchors. Postoperative medication and physical therapy are at your surgeon’s discretion. The labrum is a soft cartilage structure surrounding the socket of the “ball and socket” joint. It acts as a cushion between the two bones. The labrum can be torn from its attachment anywhere on the socket. Labral tears occur with acute dislocations, twisting injuries or chronic, repetitive stresses to the joint. The labrum can also become degenerative and tear or calcify with anatomic anomalies and extra bone formation (see Pincer Lesion in Femoral Acetabular Impingement). Labral tears cause deep groin pain. Depending on the size of the tear, clicking or popping may be felt with certain hip motions. Pain can occur with going up and down stairs, squatting, sitting cross-leg, or prolonged sitting. 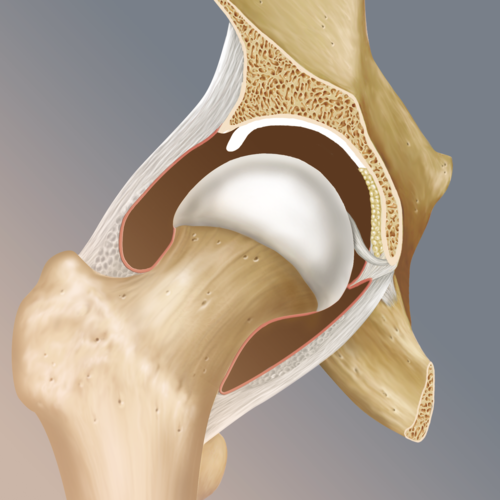 Labral tears that displace into the joint can cause a locking sensation. Your surgeon will perform a thorough history and physical exam with X-rays. The hip will be moved through a range of motion and stressed in certain ways to elicit pain or popping. X-rays may or may not show evidence of FAI (particularly Pincer lesions). MRI (with contrast dye) is helpful for evaluating the labrum. Your surgeon may also suggest minimally-invasive hip arthroscopy to evaluate the structures of the joint if the diagnosis is unclear based on physical exam and MRI. Labral tears are sometimes misdiagnosed as tendon or muscle strains. Even if accurately diagnosed, your surgeon may prescribe anti-inflammatory medication, physical therapy and activity modification to decrease pain and inflammation. If the symptoms resolve, no further treatment is necessary. Your surgeon may also offer an injection, which both confirms the diagnosis and decreases pain. 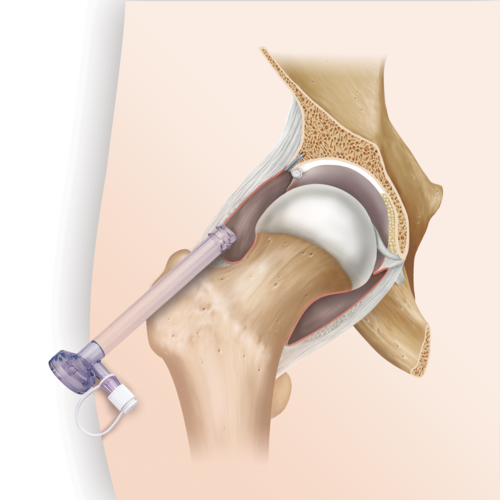 Operative treatment of labral tears consists of minimally-invasive hip arthroscopy. Your surgeon has multiple options to repair the torn tissue, remove it or reconstruct the damaged tissue if the torn tissue is not amenable to repair. Repairing the tissue is completed with a series of sutures and anchors. If the tissue is reconstructed, a graft (from a donor) will be used in place of the damaged tissue and repaired to the bone with sutures and anchors. Postoperative medication and physical therapy are at your surgeon’s discretion.